Cameron is the Vice President of Product Management responsible for Workforce Engagement Management with over 17 years of experience across operational and consultancy roles. He is responsible for the delivery of solutions to the market including Strategy and Commercial Readiness. 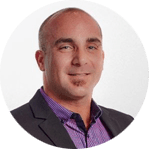 Since beginning with Genesys in 2008, Cameron has been providing organizations globally with transformational thinking and delivery focused on Employee Engagement and Customer experience. He is a certified Customer Experience Professional and is currently based in Raleigh, North Carolina.